In our previous oscilloscope projects, we have acquired data continuously: after clicking the Run button, the oscilloscope continuously acquired and displayed data until the Stop button was clicked. Sometimes it is desirable to obtain a single set of data. This is often the case when our data are the result of some event; for example, we might want to measure sound levels resulting from an explosion. We would really just like to measure the data beginning from the time of the explosion, and terminate data acquisition a short time after the explosion. We can do this with our scope by using single sequence acquisition. In this project, we will acquire vibration data from the piezoelectric sensor in our parts kit. Be able to use the Analog Discovery™ oscilloscope to perform Triggered Acquisition of time-varying voltages. 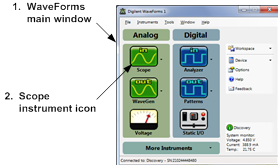 Use the Analog Discovery oscilloscope to perform single-sequence data acquisition. Connect the terminals of the sensor to the terminals of channel 1 of the oscilloscope. Insert the leads of the piezoelectric sensor into your breadboard. 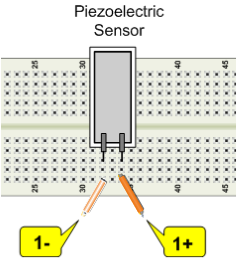 The leads of the sensor should be in different rows of the breadboard. Connect the terminals of channel 1 (1+, 1-) to the sensor's terminals. Open WaveForms™ to view main window. Click on to start acquiring data. The waveform should scroll past the screen. “Flick” the piezoelectric sensor. A signal should appear on the oscilloscope display, showing the voltage output of the sensor. At a time base of 200 ms/div, very little detail is visible relative to the sensor's response. Try changing the time base to 50 ms/div and 20 ms/div. These time scales will provide better resolution of the signal, but actually getting the complete signal to display on the screen becomes a problem. Try it! Click on to start acquiring data. The trigger indicator just above the display window should read , indicating that the scope is ready to begin acquiring data once the trigger condition is met. Flick the sensor. Once the trigger condition is met, the indicator should show , indicating that the scope has triggered. Once the data is acquired, it will be displayed in the scope window. The data will be held in the window until you re-click on and again meet the trigger condition. This ensures that the desired data is not replaced if the scope is re-triggered, as would be done if the oscilloscope were accidentally re-triggered during continuous acquisition. Change the time base and trigger condition. Observe the behavior of the scope for long time bases. Does the behavior match what you would expect?